A 24-year-old Frenchman who joined Al Qaeda forces in Syria has reportedly been killed by a US drone strike, according to the French news magazine L’Express. US officials confirmed the news Thursday morning. 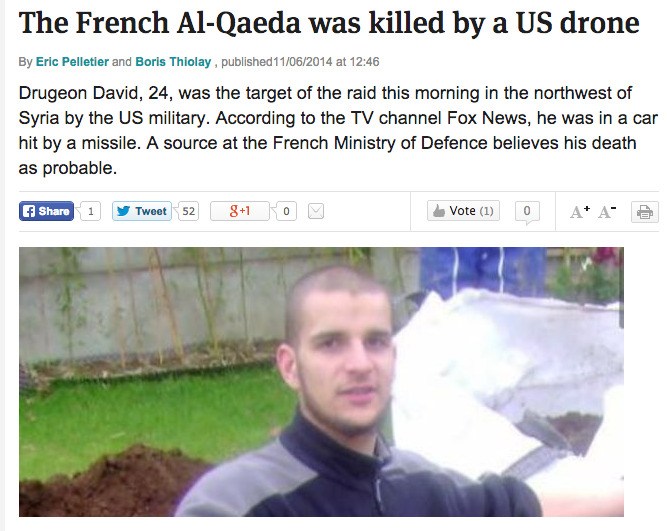 The raid reportedly targeted David Drugeon, also known as Daoud, who has been called a “veteran French jihadist.” Drugeon was reportedly travelling in a car when he was killed in the drone strike, which also targeted a building used by the Khorasan Group, an Al Qaeda affiliate. It is likely that Drugeon was radicalized in France at a young age and then later went to fight with jihadists in the Middle East. “His is the unlikely story of a Catholic boy from Brittany who grew up to become an important member of Al Qaeda, achieving the youthful success in the jihadist underworld that eluded him in normal life,” intelligence expert John Schindler reported. Drugeon is thought to have joined Middle Eastern terrorists around 2010. He reportedly started out in Egypt before making his way to Pakistan and eventually Syria.